NASA is optimistic about the ion propulsion system, and so do we, as the scientists say it’s the future for the fast travel to Mars and beyond. let’s see how does the ion engine works. The ion engine works by knocking off an electron into a chamber filled with xenon gas or argon gas to ionize it (to make positive ions). The positive ions then diffuse into a region where the charged grids that contain an electrostatic field created by a power supply and magnets accelerates the positive ions out of the engine and away from the spacecraft thereby generating thrust. Ion propulsion can be used for years in space. So, NASA uses the ion engine in satellites and other relatively small spacecrafts to give them thrust to put them into orbit and for maintaining the low earth orbit, instead of using the more expensive hydrogen fuel propulsion system. Ion Engine is used in satellite and other space crafts for the maneuvering to go into, stay, leave orbit and go to another destinations. 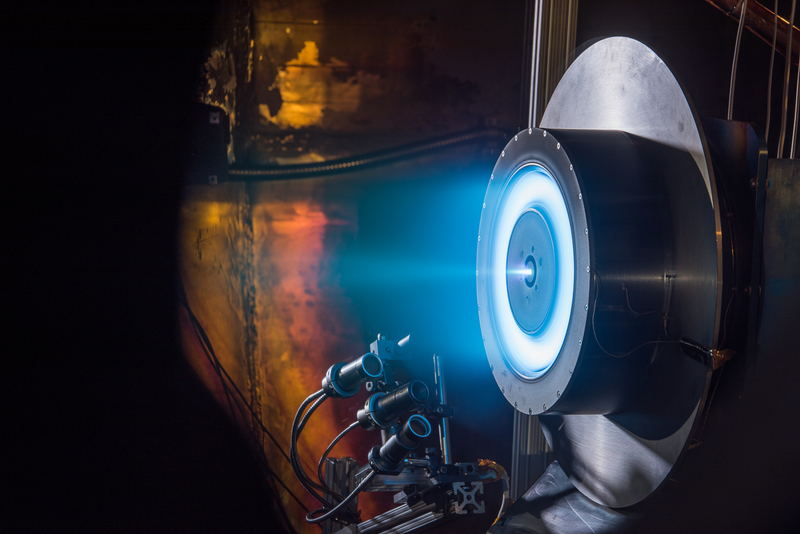 Due to the efficiency of ion engine, NASA and Jet Propulsion Laboratory are improving the ion propulsion system to be faster to reach deep space with less cost. The downside of the ion engine now is the speed, the current ion engine that is used now in satellites, gives the spacecraft an acceleration from 0 to 60 MPH in about 4 days. Ion thrusters (based on a NASA design) are now being used to keep over 100 geosynchronous Earth orbit communication satellites in their desired locations, and three NSTAR ion thrusters that utilize Glenn-developed technology are enabling the Dawn spacecraft (launched in 2007) to travel deep into our solar system.